Okay, this time I was legal. We kept the fish we caught! Wendell and I took the boat we had on the Gulf yesterday to Lake Pan. It is a nice sized party boat, a 30 footer with a kitchenette and a closet built for a toilet (bucket with a seat). We did pretty good. 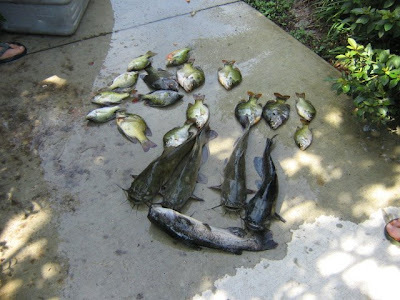 We caught a number of catfish, brim, and something Wendell called a mudfish. 21 fish in all. 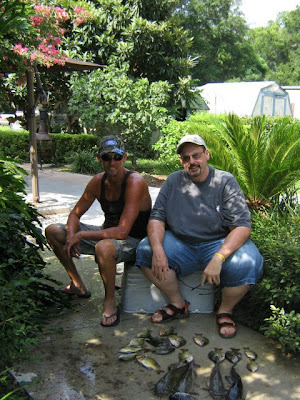 We used hotdogs and shiners for bait, but the most important thing was talking to the fish. Wendell said I needed to do it to catch the fish, I laughed, but when I humored him and tried it within a second (honestly) I had a bite. I was out talking to the fish after that. We started out moving to a few fish bed around the lake, but Wendell noticed that they had been fished recently so we moved the boat into a creek that feeds into Lake Pan. that looks like so much fun to be handing out in florida. enjoy!